The busting of the housing bubble has been met with much finger-pointing. Advocates of smaller government and an unfettered free market have been quick to blame Fannie & Freddie and the Community Reinvestment Act, claiming that this is ‘another example’ of government incompetence. The argument of course, is that Fannie & Freddie (nationalized banks) made bad loans and the CRA pushed (if not forced) private lenders to make loans to borrowers who, under normal lending standards, would not qualify for loans. The problem with this argument is that it was not GSE’s (Government-Sponsored Enterprise) like Federal National Mortgage Association (Fannie Mae) and the Federal Home Loan Mortgage Corporation (Freddie Mac) that made the bulk of these loans, but rather private lenders in a less regulated sector (and therefore not subject to the CRA). 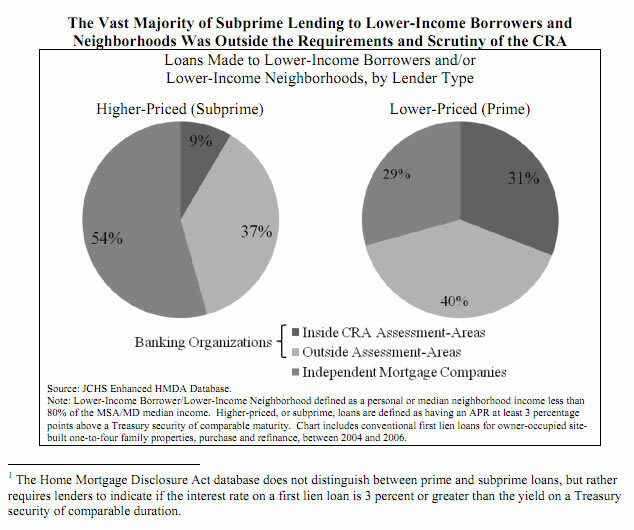 Their data clearly shows that the vast majority of subprime lending was conducted by lenders outside of CRA scrutiny, and therefore under no government ‘coercion’ to lend to lower income and/or higher risk borrowers. A study from the the Federal Reserve revealed the same. Only 6 percent of all the higher-priced loans were extended by CRA-covered lenders to lower-income borrowers or neighborhoods in their CRA assessment areas, the local geographies that are the primary focus for CRA evaluation purposes. This result undermines the assertion by critics of the potential for a substantial role for the CRA in the subprime crisis. In other words, the very small share of all higher-priced loan originations that can reasonably be attributed to the CRA makes it hard to imagine how this law could have contributed in any meaningful way to the current subprime crisis. It’s clear that after 2003, outstanding mortgage debt held GSEs like Fannie and Freddy began to drop while asset-backed security issuers increased. 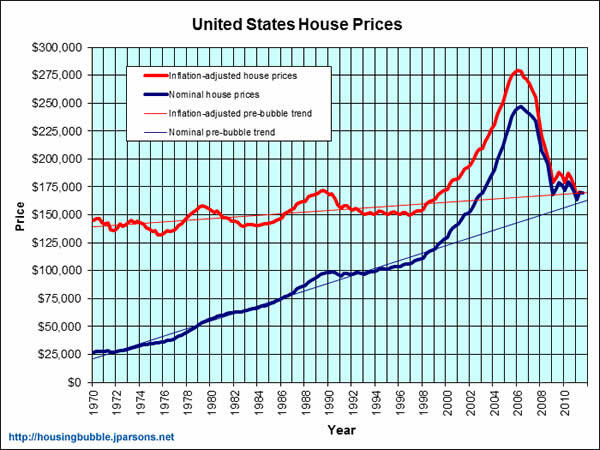 The chart below shows the contemporaneous increase in housing prices. It’s clear that GSE’s like Fannie and Freddy were pulling out of the market when the bubble was really getting underway while private asset-backed security issuers were jumping in head first. Republican Gridlock & Obstructionism – Fact or Myth?